For most modern Porsche models including 993TT. Available up to 350mm diameter in both 4000 & 5000 series and one & two piece designs. These high carbon content steel rotors feature an innovative slotted and cross-drilled design with the University developed Kangaroo Paw ventilation system. The Kangaroo Paw design cools the rotor faster working on the same principle as an air-impeller designed to extract heat and increase the rotors efficiency. Ideal for use with most high-grade performance or standard OEM brake pads. Now in stock for most modern Porsche models including 993TT. Available up to 350mm diameter in both 4000 & 5000 series and one & two piece designs. These high carbon content steel rotors feature an innovative slotted and cross-drilled design with the University developed Kangaroo Paw ventilation system. The Kangaroo Paw design cools the rotor faster working on the same principle as an air-impeller designed to extract heat and increase the rotors efficiency. Ideal for use with most high-grade performance or standard OEM brake pads. The new disc flange design allows the disc to float in its fixings allowing radial and axial expansion of the disc without being constrained to warping & cracking like the one piece Oem discs. Zero rattle & ideal for Competition, Track Days, Fast Road & Touring applications. ( Used with Carbon Metallic or other high grade pads for best results ). Exceptional manufacturing standards - Run out less than 0.0254mm. Thickness variation less than 0.00762mm. Surface finishes less than .7 microns. Dimpled slotted pattern - developed from race technology - for quieter operation. Patented ‘Direct Drive’ attachment system eliminates thermal judder & cracks. Ready assembled 2-piece design allowing for replicable discs. Available complete with matched brake pads for improved performance. Applications; Porsche 996 C2, & C4, All Boxster S models, Cayman. 997 , 996 GT2 & GT3, 997 GT2 & GT3. Also applications are now in stock for all 996 GT3 Mk1 requiring a 350mm front brake upgrades & all PCCB factory replacement models. Carbon Metallic brake pads; Carbon Metallic brake pads are comparable with other high grade pads and are used extensively in NASCAR, GT & Touring car applications throughout the worlds professional motorsport teams. Performance Friction Brakes outperform the competition by more efficiently distributing heat for lower lap times, longer life and improved driver control (Left = Brembo, Right = PFC). 911uk recommends the use of Performance Friction Braking Systems and Pagid Brake Pads (more information as listed below), which are available from the above 911uk recommended Porsche Tuning suppliers. Bremsen Technik GmbH is the Motorsport division of PAGID. The high performance brake pads are marketed under the ‘PAGID RS’ brand. With facilities in Rosbach and Essen in Germany, they are one of only a small number of companies capable of developing and manufacturing brake friction for use in the premier Motorsport competitions including Formula 3, World GT Racing, Touring Cars and Porsche Super Cup. 'PAGID RS' Competition Brake Pads are fitted as original equipment to some of the most prestigious and powerful production cars in the world including Porsche and Ferrari, and in particular where Carbon Ceramic disc technology is used. These brake pads are available to fit many of the popular racing caliper applications and also may be fitted as an upgrade to many standard calipers for high performance cars. 'PAGID RS' Competition Brake Pads are produced in several different material formulations – each one the product of thousands of hours of testing and development work. They are designed to produce the highest possible performance levels over a wide range of operating conditions. Few brake friction compounds are as highly regarded as PAGID RS4-2 (known by many as 'PAGID Blue'). Originally developed in the late 1980's RS4-2 remains a most versatile friction compound. Designed as the ultimate fast road user friendly road material to satisfy the demands of the Porsche sports cars and other prestige manufacturers such as Ferrari, Lamborghini and Maserati. The latest development from the engineers at PAGID, the initial design criteria was for a material specific for F3. Initial feedback shows that this compound is a great all rounder. RS14 is our most popular ceramic based friction material. Compared to RS4-2 this compound offers a good increase in initial bite and average torque, it has very good modulation characteristics and offers good control against wheel lock ups at all temperatures. This material provides very good levels of performance and response at all temperature levels, only slight temperature inputs are required to bring the pad up to its optimum performance level. A true favourite with endurance racers having won many classes at all major endurance events. A similar friction coefficient to RS19 but with improvements in initial bite offering quicker response and slightly more temperature stable at the upper levels of the temperature range. Designed primarily for endurance racing, due to consistent performance level and user ability, competitors use this for sprint and short distance races. PAGID Racing Brake Pads are produced in nine different compounds. PAGID racing compounds are complex formulations with very high ceramic material content. 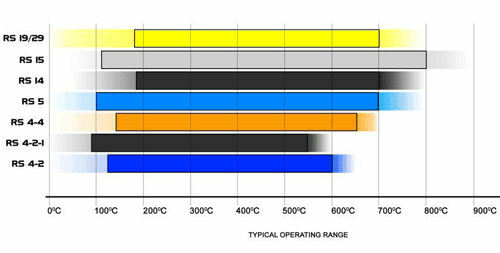 The main difference in comparison to “Metallic compounds” is the superior thermal insulation and higher heat resistance. PAGID Racing Brake pads are specifically developed for Motorsport use. However subject to the requirements of “Regulation 90” they may also be fitted to road cars (RS4-2-1 and RS4-2-2 in particular) where exceptional braking performance from high speed is required. This may be particularly relevant when driving in European countries with unrestricted roads. Allow for a distance of 300 - 400metres between brake applications for cooling period. Pads should not reach temperatures above 400°C during initial bedding in. Check that pad surfaces have at least 80% contact with disc before allowing more heat into pad surface. 1 brake application with medium to high pedal pressure from approx 110mph to 50mph without allowing wheels to lock. Allow 3-4 recovery brake applications with light pedal pressure. Repeat high speed applications including recovery applications another 2-3 times. Allow a cooling off distance of 500 metres between high speed applications. This is the result of friction being lost between pad and disc surface due to the friction material exceeding its maximum operating temperature, usually due to the build up of hot gases between the pad and disc surface. The pedal feel remains constant but the vehicle is not retarded. f pad fade regularly occurs, an upgrade to a material with a higher operating temperature should be considered. If the highest specification material is being used, consideration should be given to increasing disc size if possible, or improving cooling to the brakes. The main problem area with high performance braking systems is always the control of the thermal energy. Brake disc and pad temperature analysis can be used to indicate the temperature range the brakes are operating in. With this information material alternatives and cooling aspects can be considered and tried.